Tropical Storm Michael's trajectory as of Tuesday morning via the National Hurricane Center. Evacuation notices are beginning to be issued for coastal counties and Leon County and Gadsden County have opened emergency shelters. The following shelters will be open Tuesday, October 9 at 12 p.m. Shelter attendees will need to bring a form of identification. Mandatory evacuation orders are now in place for zones A, B, and C. The link below will take you to the map to search by address. The order will be issued at 6 am Tuesday morning. Chief Mark Bowen is asking for those who can do so to evacuate Monday. • In the City of Port St. Joe all areas from St. Joseph Bay to Long Avenue. All of these areas must be evacuated within 24 hours of this notice. Critical Businesses in those areas may remain open until 12:00 PM ET Tuesday, October 9, 2018. Voluntary Evacuations are in place for Hwy 98 Inland on St. Joe Beach and Beacon Hill. Gulf County residents will NOT be required to obtain Re-Entry tags. At the checkpoints, you will need to provide your Florida State ID/Driver’s License OR documentation showing proof of residency/ownership, such as a utility bill. Honeyville Community Center will open at 10:00 AM ET, Tuesday, October 9th. Please be sure to bring, food, water, blankets, medicine, comfort items for children, prescription medications, etc. MANDATORY evacuation orders issued for Zone A (coastal and low lying areas) and Mobile Homes and other weak structures. VOLUNTARY evacuation notices are in place for the remainder of Wakulla County. Evacuation orders will start effective at 8 pm this evening (October 8th). Citizens that are evacuating should evacuate to an area outside of the storm’s path. Neighboring counties will also be in the storm’s path and there for at risk. THERE WILL BE NO SHELTERS OPENED IN WAKULLA COUNTY. 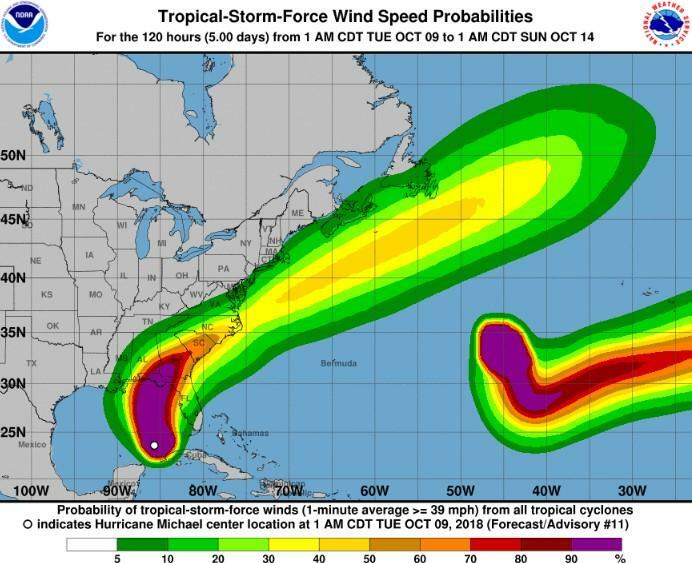 This is because all of our shelters are rated safe for Category 2 and under hurricanes and Hurricane Michael is forecast to become a Cat 3 by landfall. Please evacuate to Leon County. The location of those shelters will be provided when they are available. Current Storm surge levels are projected to be 8 to 12 feet, as a reference Dennis was about 10 feet. Sandbags are available at the Sheriff’s office with a limit of 10 Sandbags per trip. A Mandatory Evacuation has been issued for all NON-Residents at this time. If an evacuation is ever needed a notification will go out from Emergency Management as well as press releases, Alert Franklin and over social media.